When is a TV series not a TV series? 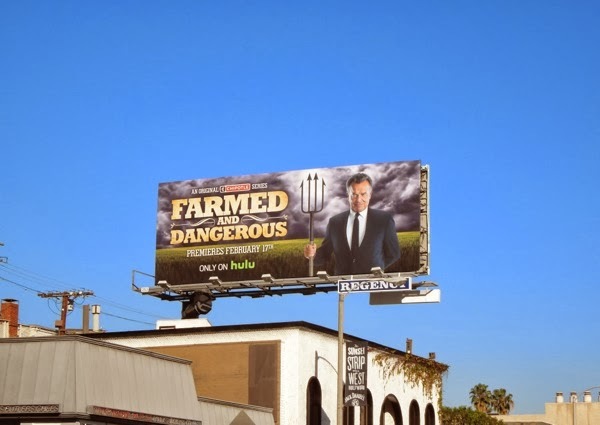 When it's a sneaky advert for a fast food chain masquerading as a television series called Farmed and Dangerous, that's when. Chipotle Mexican Grill is a restaurant franchise that prides itself on its food and environmental integrity, whether it's the ingredients in the food they are putting in front of you, or their 'green' operations and how they get that produce from farm to plate. No stranger to doing things differently, the fast food eatery already has experience with filmmaking with their wickedly inventive animated short The Scarecrow. 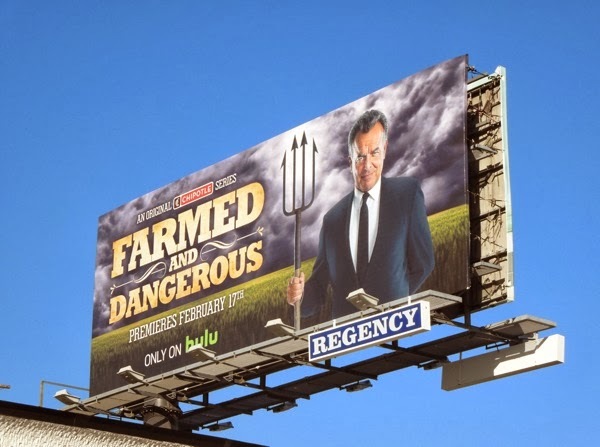 Their latest initiative on the small screen is a new four episode comedy series on Hulu, which delves into and parodies the seemingly outrageous practices of the world of industrial agriculture (and comes complete with exploding cows). 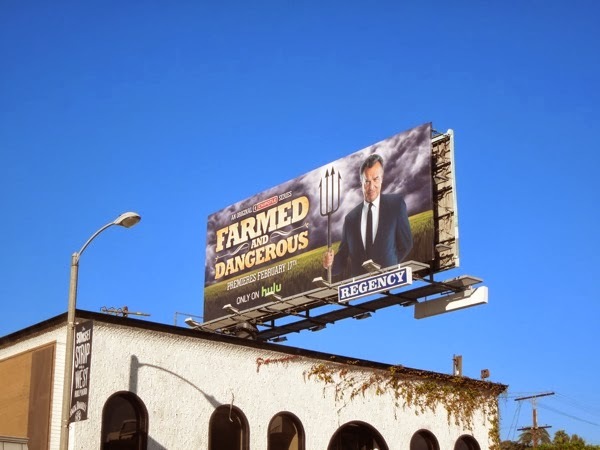 The recognisable Ray Wise stars as 'Buck Marshall' as the head of an organization representing big industrial food production companies, like 'Animoil', who want to feed their cattle 'PetroPellets', which have the unfortunate side-effect of making their livestock explode. Meanwhile John Sloan stars as 'Chip', the advocate of a Sustainable Family Farming Association, a David to the food industries Goliath. Let the battle for our hearts and minds commence, and to the victor the spoils. 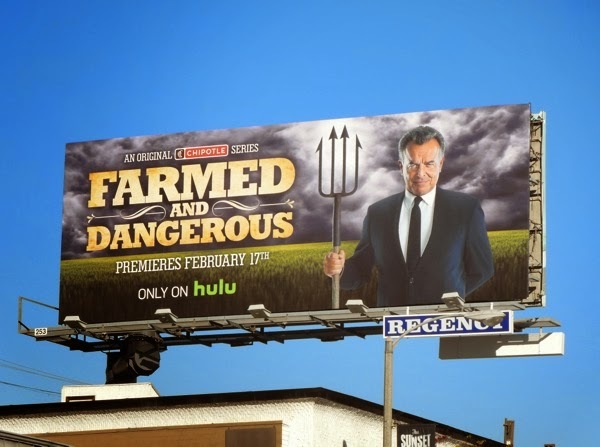 This devilish billboard for the satire, featuring Ray Wise in a partial homage to Grant Wood's infamous American Gothic painting which showed a farmer with a pitchfork beside his daughter, was spotted along the Sunset Strip on February 13, 2014. Let's see if this subtle form of promotion works just as well as the mega-bucks spent by the bigger, more established fast food chains. If you're a fan of the restaurant chain, be sure to also take a look at these clever Chipotle Mexican Grill billboard campaigns from previous years.